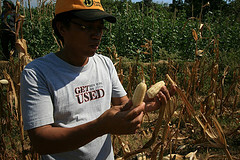 Mr. Ronaldo B. Calica, a farmer whose crop s are mainly corn, said that this is the worst drought ever. The sources of water in their area are the small creeks nearby and they are mostly dependent to rain. According to him, the last rainfall they had was when typhoon Pepeng hit the country last October 2009. After that, they didn’t experience any rainfall at all. He normally earns around 10 to 15 thousand pesos from his 1 hectare of corn but now it’s zero balance. He spent too much for the gasoline of his water pump and fertilizers but it was all for nothing because his land got dried up due to insufficient supply of water. He showed us his corn crops that are so small he can no longer use it. On the other hand, Mr. Jessie Castillione, a farmer since his elementary years, showed us his vegetable farms that were also destroyed by the extreme drought. 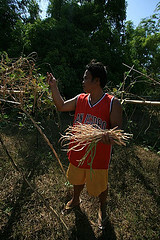 His crops are long beans (sitaw) and bitter gourd (ampalaya) and they all got dried up even though it’s near the creek. He also shared to us that his rice lands have gotten affected by the landslide caused by Pepeng. His rice land submerged into the sand and it would take time before he can plant any crops on it. As we walked around their fields I can see how much they have lost due to this phenomenon and as I listened to their stories, I know they really put a lot of effort in trying to save their crops. All they’re hoping and praying now is rain, because that is the only thing that can save their source of living. Wow, wonderful blog layout! ңow long haνe ƴoս been blogging fߋr? fantastic, aѕ well as thе content!